Sangiovese and Grenache might be an unusual coupling; no precedent drove me to craft this blend. For awhile I’d been thinking of our original Apricots blends from the 90s, which were fun blends with a different, racy and food-friendly Italian feel that stood the test of time. In 2010 I saw some of that potential with our Sangiovese and Grenache, so on that hunch I did a trial blending those two. Together they had a light and dark kind of interplay that was really promising, and they showed that tart and tannic Italian feel that I liked so much in our first Apricots bottlings. With that trial Apricots was reborn! This 2011 release flips the previous 2010 on its head. Here it’s the Grenache that brings the darker, more brooding presence in the blend. 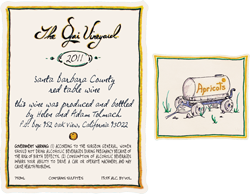 In 2011 the John Sebastiano Grenache was punchy and firm, and just packed with purplish red fruits, showing that Persian mulberry note that has since proved a mainstay. White Hawk Sangiovese gave more bright red tones, with rich tart cherry, plum and dusty tobacco flavors. Together they offer knockout aroma and an intensely woodsy panoply of fruit, with subtle salty streaks that appear in the background. This wine is all about sinewy muscle, with dense and energetic flavors that finish with some grippy verve. Though six years in bottle has given it elegance and harmony, still I’m finding it most gratifying with any kind of hearty meat dish (it’s perfect with some beef shank Osso Bucco). Really the whole notion of Apricots was to craft a food-friendly kind of wine, so maybe it’s best enjoyed that way!